We’ve recently been trying out a few new ways of spreading the word about our Democracy websites. New to us, that is. Clearly, leaflets, videos and posters aren’t exactly groundbreaking concepts in the wider world, but as a digital organisation with limited budgets for marketing, we’ve not really explored them in any depth before. The motivation was something that’s one of our major drivers across lots of our work these days. Our own research has shown that our services are simply not reaching those sectors of society who might need them most: the least well-off, the less-educated, the young, and all sorts of minority demographics. Ever-conscious of this shortcoming, we’re doing what we can to address it on multiple fronts. 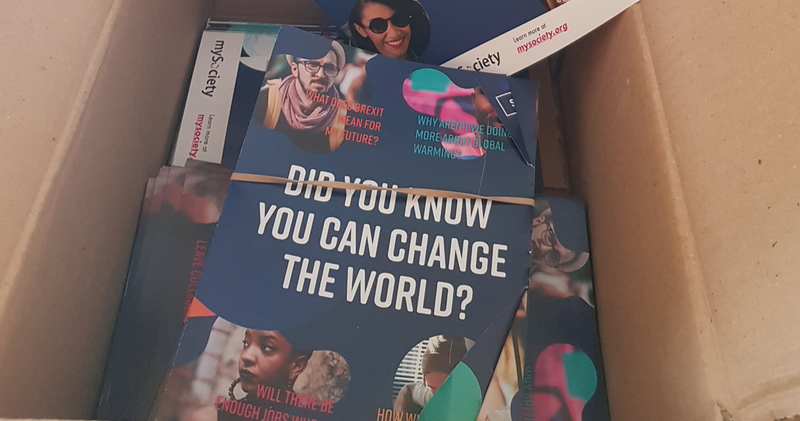 These latest experiments in print and video represent an attempt to learn more about what might work, and as with everything we do at mySociety, we’re keeping a careful eye on the outcomes. If we see good results then there’s an argument for rolling out similar approaches more widely and to different communities. Recent funding from the Joseph Rowntree Charitable Trust helped us to try initiatives that would help publicise TheyWorkForYou and WriteToThem to younger people, like this animated video. A video will only work if we can get people watching it though, so please help us spread the word by sharing it, especially if you know people aged around 16-25 who might find it of interest! We wanted to let schoolchildren know that TheyWorkForYou and WriteToThem can provide a channel to get things changed, ask for help or express their views. While we’d love to send leaflets and posters to every school in the country, that’d be rather expensive. So as a first step we identified 100 schools in the most deprived areas of the country (using the areas of deprivation index) and sent them a batch each. That way, we hope to reach young people who also might be most in need of empowerment. We also kept back a limited number of surplus posters and leaflets, so if you’re from a school and you’d like us to send you some, drop us a line (first come first served). 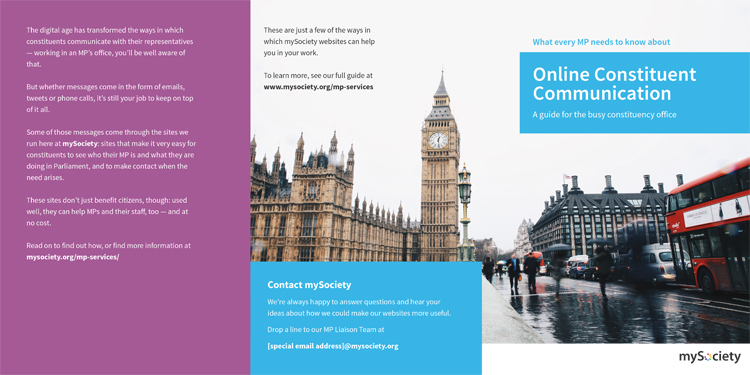 It’s not quite in the same category, but we’ve also been in touch with every MP in the country, to let them know what we’re all about and how they (and their staff) can use our websites to best advantage. Now and again we hear MPs saying things that show they’ve misunderstood our aims, funding, principles or provenance — our recent blog post shows a couple of examples of this — and to be fair, we haven’t made much effort recently to talk to representatives directly. So this is an attempt to redress that, and invite any elected representative to get in touch if they’d like to ask us some questions. We’ll be keeping an eye on whether our user demographics change at all in the near future, and you can be sure we’ll report back if we see anything notable.